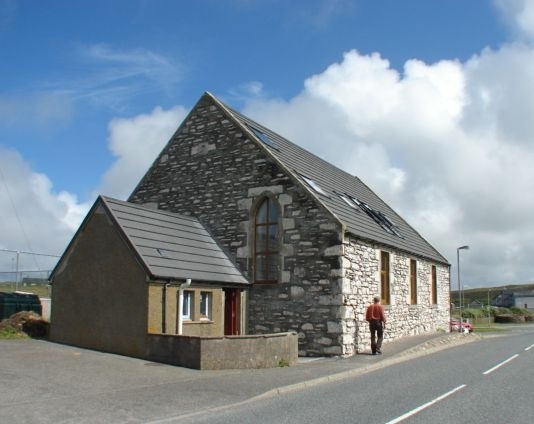 Newly converted church in the picturesque village of Walls, approximately 40 minutes drive from Lerwick. A great location to explore the rest of Shetland and ideally placed in the centre of the beautiful west side. There is a spectacular open plan living/dining/kitchen area featuring church windows, glass and oak staircase and is open full height to the roof beams. There is one double and one twin ensuite room plus a further two double bedrooms, one featuring balcony windows with fabulous views over the bay and marina and out to the islands of Linga and Vaila. There are a further two bathrooms. This makes it ideal for large families or groups. There is a balcony area on the upper floor. A cot can be provided on request. Separate utility room fully equipped with laundry facilities. The property is fully centrally heated and finished to a high standard.Parking for several vehicles. Local amenities in walking distance include shop, swimming pool with sauna, playpark, multicourt and beaches. Stunning views, walks and wildlife.